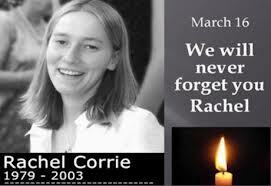 “On 28 August, the Haifa District Court in Israel dismissed a civil damages law suit initiated by the family of Rachel Corrie, a young American peace activist, who on March 16, 2003, was killed by an Israeli armed bulldozer in the Rafah region of Gaza. Judge Oded Gershon ruled that her death was ‘a regrettable accident,’ blaming the victim for her own death because ‘any thinking person’ would have stayed away. The judge’s decision represents a defeat for justice and accountability, and a victory for impunity for the Israeli military. Such a shocking rationale flies directly in the face of the Geneva Conventions, which impose on an occupying power an unconditional obligation to protect the civilian population. Additionally, by Article 10 of the Fourth Geneva Convention a humanitarian aid worker such as Rachel Corrie is specifically entitled to protection by occupying forces, and the house demolition itself seemed an unlawful encroachment on Article 147, which prohibits targeting civilian property, in this case a home belonging to a civilian pharmacist, his wife and children. This is a sad outcome, above all for the Corrie family that had initiated the case back in 2005, but also for the rule of law and the hope that an Israeli court would place limits on the violence of the state, particularly in relation to innocent and unarmed civilians in an occupied territory. Israeli governmental institutions have consistently embraced impunity and non-accountability in responding to well-documented violations of international humanitarian law and in many cases Israel’s own criminal law. It is impossible to separate the outcome here from a pattern of similar results exonerating military actions and the political leaders who ordered them, in Israeli investigations of the killing of Palestinian civilians during the Operation Cast Lead attack on Gaza or the commando assault in 2010 on Turkish ships filled with activists bringing humanitarian supplies to the blockaded people of Gaza. The Corrie family has announced their intention to appeal this verdict to the Israel Supreme Court. But it becomes a mockery of justice to leave their application to the partisan mercies of the Israeli judicial system. Even the U.S. ambassador to Israel told the Corrie family that Israel’s military investigation, which Judge Gerson had approved, was not ‘thorough, credible, and transparent.’ Has not the time finally arrived where the states parties to the Geneva Conventions should act to fulfill their duty under Article 1 ‘to respect and ensure respect’ for the obligations of the treaty ‘under all circumstances’”? The truly sad part is they feel the need to ‘armour’ a bulldozer … to the extent perhaps that they can’t see out of it. Truly an unsafe piece of equipment to be using … whether to move dirt, which is what they were invented for, or knock over doctor’s houses, which is the travesty. The court case – a suit brought seeking ONE dollar against the state – was about ‘justice’ in a system of fear which believes the end justifies the means – and that feeling pervades both sides of the battle. In Israel even civilian buses are armored in certain areas because the Palestinians do not differentiate between civilians and soldiers and try to kill everyone. Every restaurant has a security guard at the entrance because they got blown up daily in the early 2000s by hamas which Corrie defended. The trial was about whether there was negligence. Look at the videos, there wasn’t. She was (likely drugged) and placed in deliberate danger by propagandists who use human lives for media points (like the flotilla, like Hezbullah does, then calls them martyrs).